TADPOLE is a set of standardized tools that aids in performing functional vision evaluations or visual skills development activities. It is similar to APH's kit Tools for Assessment and Development of Visual Skills (ToAD), but is geared for younger learners. TADPOLE is a natural precursor to the ToAD Program. TADPOLE does not provide a formal assessment—there are several excellent assessment tools available, including ISAVE from APH. 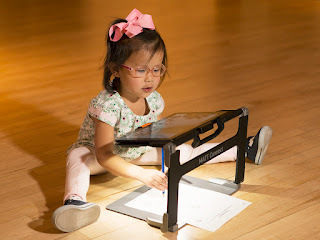 TADPOLE provides materials that assist the educator as he or she performs vision assessments or activities. Note: TADPOLE also functions as the Vision Modality section for APH's Sensory Learning Kit (SLK). The TADPOLE Practitioner's Guidebook is a collection of suggested activities, mainly for use with students who are very young (0-2 level), or who have communication and/or cognitive delays. These activities are functional, and uncomplicated, natural to the learner’s environment. Note: The optional Soft Snap Puzzles are useful with both TADPOLE and ToAD activities. Click this link to purchase the TADPOLE Kit from APH.